The press conference held at the White House on Thursday left many shocked and disturbed after Donald Trump talked over a reporter as she asked him a simple question regarding his urban city agenda. African American journalist April D. Ryan asked “Are you going to include the CBC Mr. President in your conversation with your urban agenda?…” and after he expressed his interest in including the Congressional Black Caucus he went on to tell her to “setup the meeting”. This was his first solo press conference. He continued to say he “thought he had a meeting with Congressman Cummings” after speaking with him over the phone. Congressman Cummings backfired and denied the statement, calling it false. 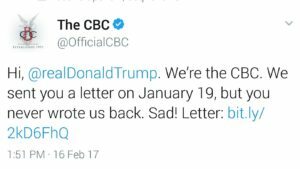 The CBC sent a tweet to Trump the same day confirming his fabrication. According to the tweet, they sent a letter almost a month ago and never received a reply. It seems that either Donald ignored the letter or deliberately did not reply . Former CBC Chairman and Congressman Emanuel Cleaver II told News One Now reporter Roland Martin “the leader of the free world has become a cartoon character”. The media continued to ask questions as they received unbelievable answers from Donald Trump, who has only been in office for 27 days. Also during the press conference, he said “leaks are real, news is fake”. Reporters were puzzled, along with millions of viewers. After 1 hour and 16 minutes, the unusual conference ended. 🙂 Children will certainly pay attention. Pressure mounted.